Week 22: Strawberry Shortcake. This week I returned to making girly lunches. My daughter loves Strawberry Shortcake (the current show, not the one from when we were kids). The main character looks much different now. The elements were a little more difficult on this one. Obviously there is not much too the cartoon character Strawberry Shortcake except, well...Strawberries, so I had to get creative. The lunch itself is fairly simple to put together. As always let me know what your child would like in this lunch and remember to like us on Facebook and check us out on Facebook, Twitter, and Pinterest! Cut out Strawberry Shortcake's head and hat out of sourdough bread. Make sure and cut out a second piece of each if you plan on making a sandwich. If making a sandwich, spread peanut butter and jam in between the slices and press together. Cut out a small neck piece from the bread scraps. Place two triangle spots of cream cheese on the bread for the eyes. Mix equal parts red, yellow, and blue food coloring to make black. Use a toothpick to apply the black, red, and green food coloring to the places shown in the picture. Cut strawberries into narrow strips for her hair. Cut a few pieces into small squares for the hat. Slice kiwis into long narrow pieces. Cut a stick of string cheese into tiny cubes. Spread spinach as background in your container. Place head piece towards bottom of the container, followed by the neck piece below it. Place hat piece right above the head, pressed up against it. Arrange strawberry hair pieces around her head and hat as shown in the picture. 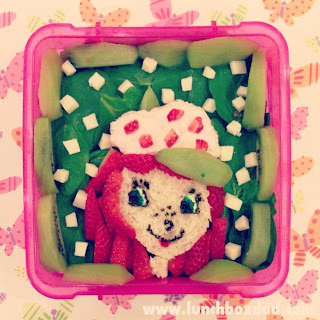 Place small strawberry squares on her hat as decoration. Take 1 kiwi slice and use it as the brim of her hat. Use another small piece for top of hat. Arrange remaining kiwi slices in a border around the container. Finish by sprinkling small cubes of cheese around the container as shown.